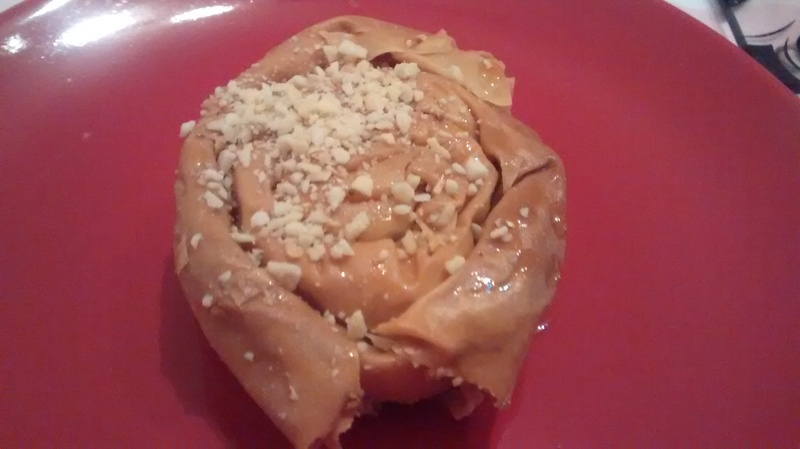 Masala chai baklava: my first GBBO bake! I am, of course, a huge fan of the Great British Bake Off. This year’s series featured perhaps my favourite contestant of all – Chetna Makan. I really admired her inventive approach to baking, often combining the classics with some amazing Indian flavours, and I pretty much drooled whenever the camera panned to her creations on screen – including this divine masala chai baklava. I’ve never made baklava before, but it was pretty simple in the end – and OF COURSE I didn’t make my own filo pastry, you crazy people. If even Mary Berry thinks the idea of making your own filo is a silly one, then I’m never even going to think about attempting it (those poor contestants, though!). The filling is just cashews, almond and cardamom ground in a food processor. The filling is then wrapped in butter-soaked sheets of filo, rolled up and twisted round to make a spiral shape The whole lot is then baked and soaked with the masala chai syrup, left to stand for a bit and soaked with some more syrup for good measure. As you can see from my pictures, that’s a LOT of syrup! 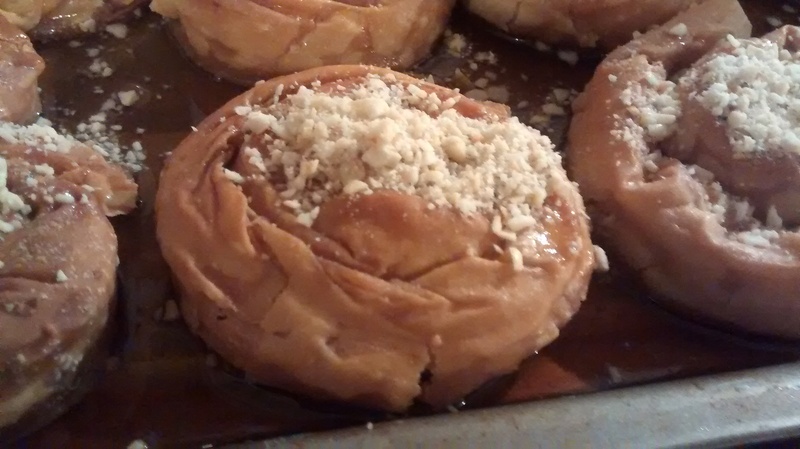 I ended up with a fair bit of the nut filling left over, so I simply decorated the baklavas with it. I did toy with the idea of deviating from the recipe and using my mum’s tea masala mix in the syrup (see my one attempt to incorporate it into my baking here! ), but I’m glad I didn’t, because the flavours of the baklava were absolutely amazing. It’s so easy to go wrong with cardamom, but the recipe has just the right amount and goes so well with the nuts, ginger, tea and bucketloads of sugar. The baklava went down a storm with our guests, and it was nice to be able to have some leftovers for breakfast the next day (what?). I would very definitely make these again, and soon! 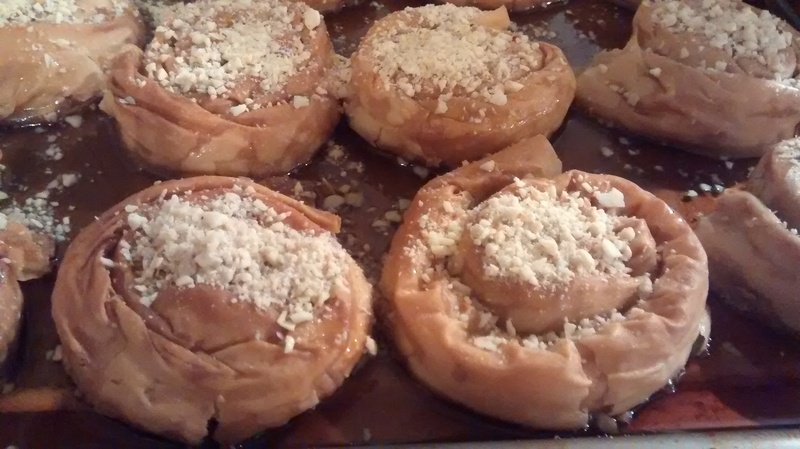 Well done, Chetna – you may not have won the series, but you’ve definitely won at baklava! ¡ Churros with chocolate sauce ! Doughnuts have always scared me. Not the eating of them, but most certainly the making and especially the frying of them. 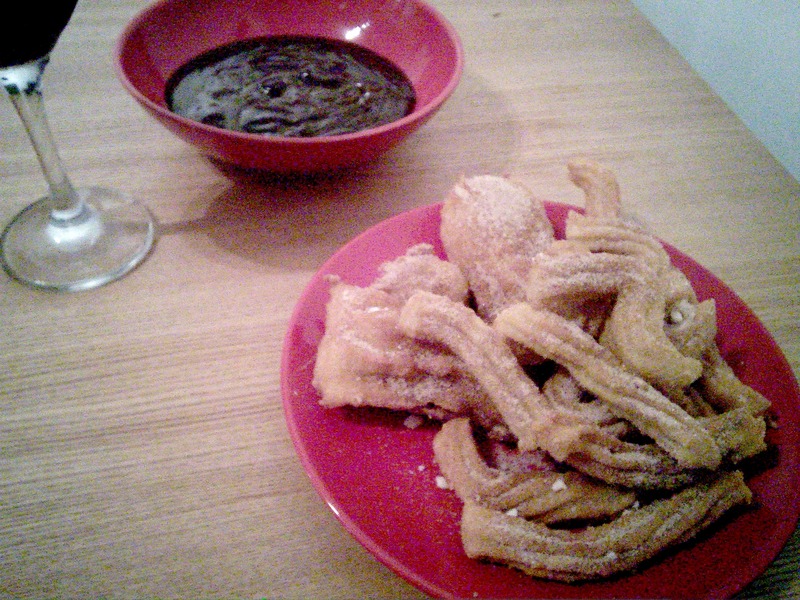 However, I came across this recipe for churros with a chocolate sauce when I was looking for a dessert to go with a Spanish meal, and was pleasantly surprised by how easy it seemed to be. I’ve had churros a few times, mainly from stalls at food markets and festivals, and absolutely love the combination of cinnamon-coated dough and a rich chocolate dip. I was unsure of how my effort would turn out in comparison, but I needn’t have worried – they were absolutely lovely. The dough was a doddle to knock up. At first I thought it was a bit too thick for piping, but then I realised that it was actually perfect. Trying to pipe with an overly runny mix is never a good idea! I made the sauce while the dough rested, and that too was a matter of just melting everything in a pan. 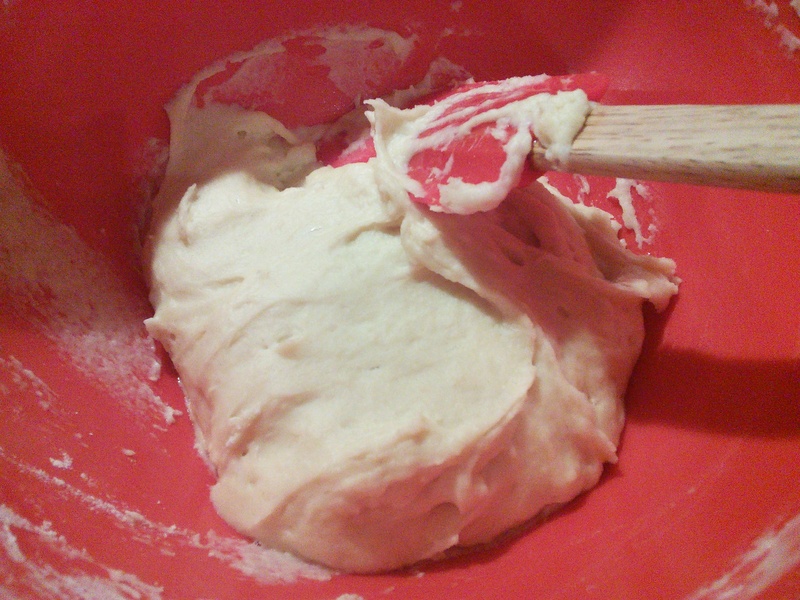 After it had rested for a bit, I got my boyfriend to help me with the piping of the dough into the hot oil. I do think this is a two-person job – one person to pipe, the other to snip off the strip of dough – but I expect there are people who a bit better than me at multi-tasking in this way! The first two churros came out very very fat, because we had to experiment with nozzles to find the perfect one. The rest were a bit more like it. Next, we coated the cooked churros in a mixture of cinnamon and sugar. I should point out that while we halved the recipe, it still made way more cinnamon sugar and chocolate sauce than we needed for the number of churros we had, so I would suggest you adjust the quantities accordingly if you decide to make this recipe. Then came the best bit – eating the churros! The churros on their own weren’t that sweet (the dough itself didn’t have any sugar in it) but, combined with the chocolate sauce, they were absolutely divine. These are definitely doughnuts to have warm. The sauce should also be warm for optimum results. I would most certainly make these again, and I might even attempt some traditional doughnuts in the near future!